Replacing the TX-8150, TX-8250 is a classic network stereo receiver designed to refresh your Home Media experience with Hi-fi Sound and built-in Chromecast. 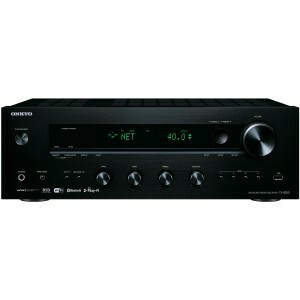 Onkyo TX-8250 Stereo Receiver offers classic stereo amplification rejuvenated with network functions that simplify audio streaming from personal devices while adding convenient ways to cast music around the home. The TX-8250 has Chromecast built-in, FlareConnect, and DTS Play-Fi multi-room technologies over 5 GHz/2.4 GHz Wi-Fi for stable connection. You can play from streaming apps with AirPlay, or stream with Bluetooth technology. As the hub of your home hi-fi, the receiver features plenty analogue and digital audio connections along with USB Audio and MM phono equalizer, so you can amplify any audio source you want. Backed by powerful yet precise amplification for expressive musicality, the TX-8250 is a flexible high-performance solution for seamless home entertainment. Stream any music from your smartphone, laptop, or PC with ease. Control playback with popular Chromecast-enabled apps you know and love from your iPhone, iPad, Android phone or tablet, Mac or Windows laptop, or Chromebook. DTS Play-Fi allows you to enjoy high-quality music from connected online services, networked media servers, and your device library over Wi-Fi to any number of compatible products using the Onkyo Music Control App for iPad, iPhone, and Android smartphones/tablets. DTS Play-Fi can synchronise the music in every room. Each member of your family can use their own device to listen to their own music in their room or group of rooms. DTS Play-Fi lets you easily structure a comprehensive multi-room ecosystem that satisfies virtually any need. FlareConnect shares audio from network and external audio input sources between compatible components. Enjoy effortless multi-room playback of LP records, CDs, network music services, and more with supported components and speaker systems. Music selection, speaker grouping, and playback management across the home are built into the Onkyo Controller app. External audio inputs supporting FlareConnect may differ depending on model. Expect fewer dropouts, faster connection, and less interference over 5 GHz/2.4 GHz Wi-Fi. Access to Spotify, TIDAL, Deezer, and TuneIn are built into the system GUI—use dedicated apps (where available) or Onkyo Controller to find and play music. Cast from PC and iOS devices from iTunes, together with other supported applications, via AirPlay technology. An AK4452VN digital-to-analogue converter from AKM features unique low-distortion filtering technologies ideally suited to the extended frequency response of Hi-Res Audio files. Excellent S/N and low-noise performance assures clear analog conversion of any digital source.